Currently we installed VNC server and client to emulate Raspberry Pi's screen on your PC. We are now going to take picture with RaspiCam and display the picture on the emulated screen. Setting up Raspberry PI Camera Board is pretty easy. In the previous Raspbian update/upgrade process, all required software are installed so you only have to connect camera board properly, which takes less than one minute. Camera board is as small as 25mm x 20mm. Just stick the end of the cable to your Raspberry Pi and all connection is done. Since we installed VNC server to Raspberry Pi and VNC client to iMac, we can emulate Pi's screen on iMac. 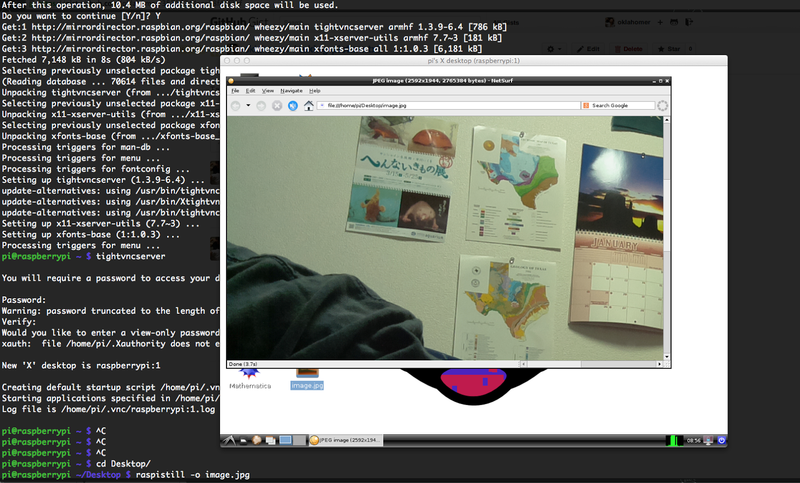 So what I do here is to move to Pi's desktop with `cd ~/Desktop` and take a picture with `raspistill -o image.jpg`. Taken photo is saved as image.jpg on desktop and it appears on your VNC screen. Double click on image.jpg. You'll see your photo displayed. Hitting `raspistill` without any option will show manual of raspistill command. Or you can find detailed document at at 'RaspiCam Documentation' and official document at raspberrypi.org. Now we are going to shoot video.